Do not wait ’till December 25th to open this gift from Missouri Germans Consortium. This newsletter is packed full of so many German stories, events and news for all of our friends and followers, that you will think you are in Germany without the airfare! Sit back and enjoy our Christmas gift to you! 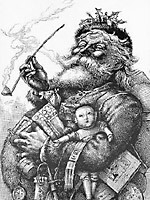 by visiting German Christmas Traditions on Mo-Germans.com for stories about the Christmas Tree, Carols, Shopping and Santa Claus and how Americans have adapted so many customs. Our immigrant ancestors brought many of these customs and traditions that we still celebrate. Peter Roloff of Maxim Films in Berlin has announced a new website and newsletter for Maxim Films that you are going to enjoy here , which has all kinds of video shorts that you can enjoy and a downloadable Utopia – Revisiting a German State in America. If you are a bibliophile – or know one that you are trying to find the perfect gift for – then visit Amazon.com by clicking here. We hope all of our friends and followers have a wonderful holiday filled with good cheer, and a happy, healthy and safe New Year! Terrific job. Tnx for the wonderful effort.